I love being able to use punches of color on my projects. And the new Artisan Resistable 8 x 8″ Paper Pack along with the Artisan Resistable Stars from Pink Paislee paired with Heidi Swapp Color Shine mists have allowed me to do just that! 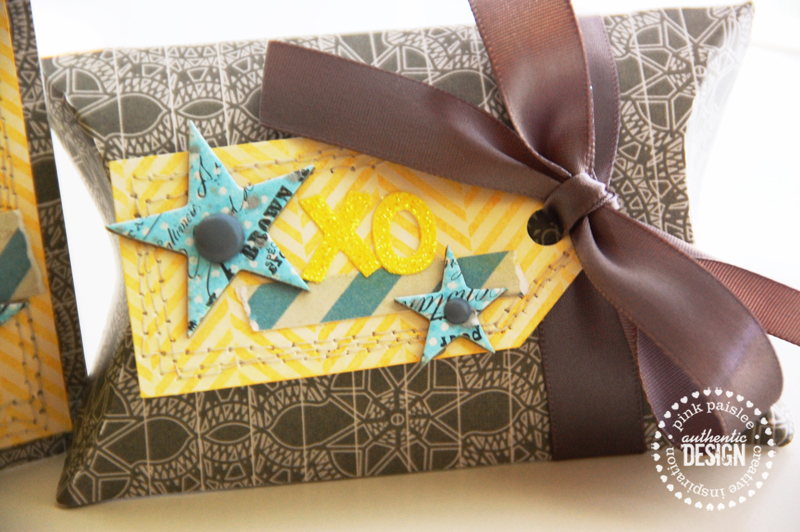 I created this card and gift box set full of beautiful eye-popping colors. I chose a gorgeous yellow, blue, & gray color combo, mixing the Artisan collection and Color Shine mists with the new Portfolio collection. I am so happy with the result! 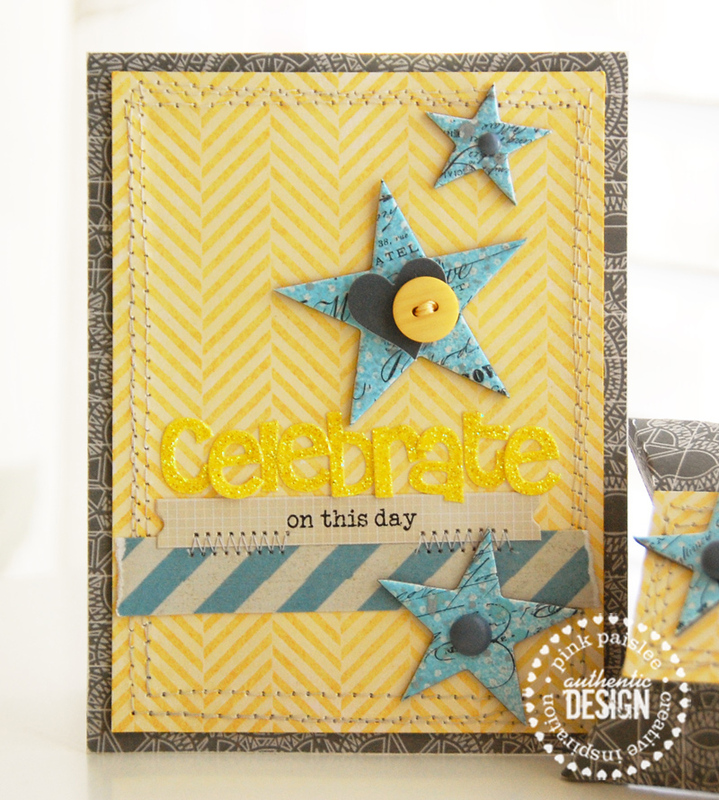 I started off by creating this ‘Celebrate’ card. 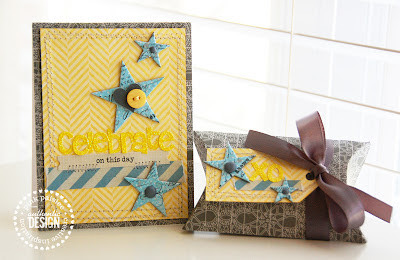 I misted the chevron patterned Resistable paper with Color Shine in Mustard. 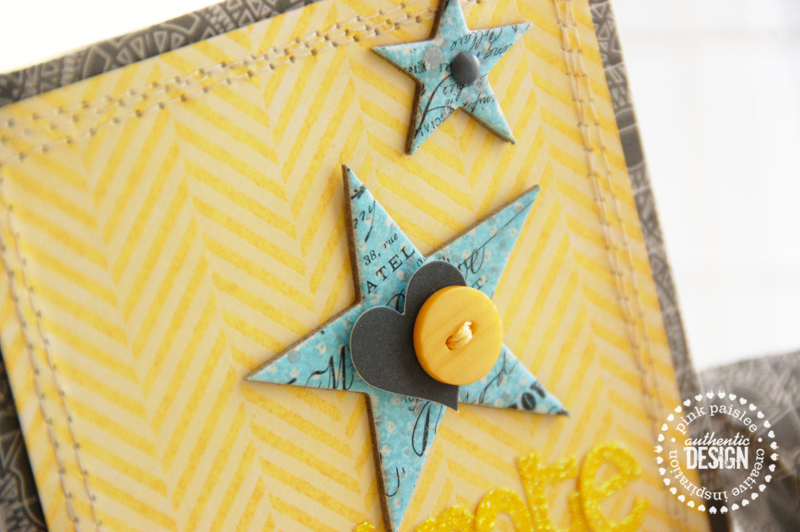 I then layered the card with patterned paper, a label sticker, and a heart die-cut from the Portfolio collection, chipboard stars from the Artisan Collection, some glitter letter stickers (an old favorite from the Sweetness collection), and some machine stitching. 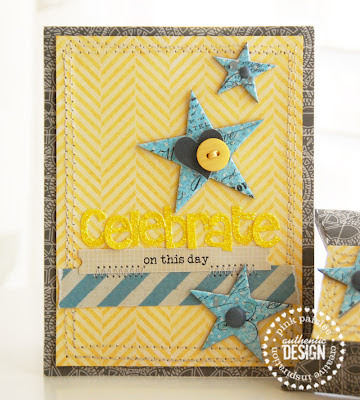 For the chipboard stars, I added some Color Shine Tropical Teal mist with a few splatters of Color Shine Tinsel. I created a fun little gift box to match. This little set could work easily for any type of occasion. Aren’t the colors beautiful?! I am in love! Check out my blog post HERE to see a complete list of Pink Paislee products used. I hope you all enjoyed today’s project. Thanks so much for stopping by!